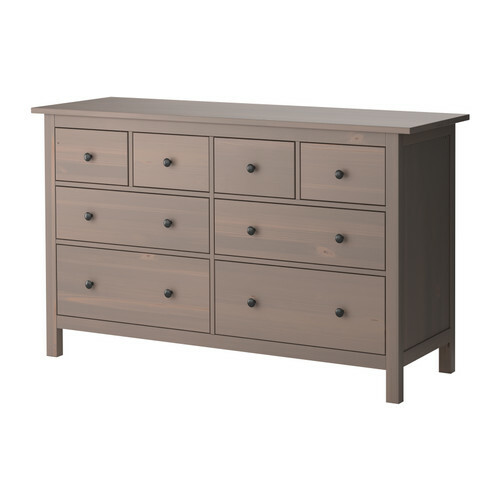 I mentioned in my post about our bedroom that I was hoping to sell our current dresser/nightstand and replace with something that fit the room a bit better. I am not sure when we’ll have the finances to do this, but it’s fun to brainstorm. 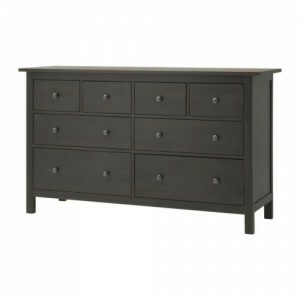 I want to get rid of the dresser/mirror, the nightstands on either side of our bed, the other nightstand, and probably get a headboard as well. 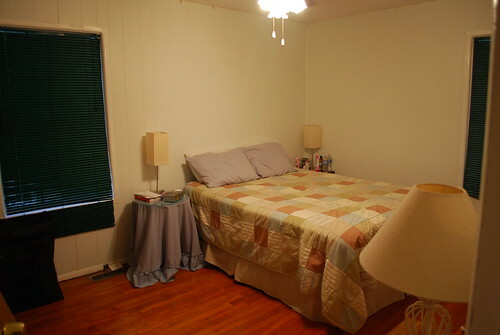 I think a nice rug would complement our room well, and we definitely need to think about window coverings/new blinds. Those would be father in the future, of course. There is also a matching headboard that I wouldn’t mind, but I don’t have strong opinions on the subject. I’ll have to be creative about replacing the mirror, but Ikea has a lot of fun options. 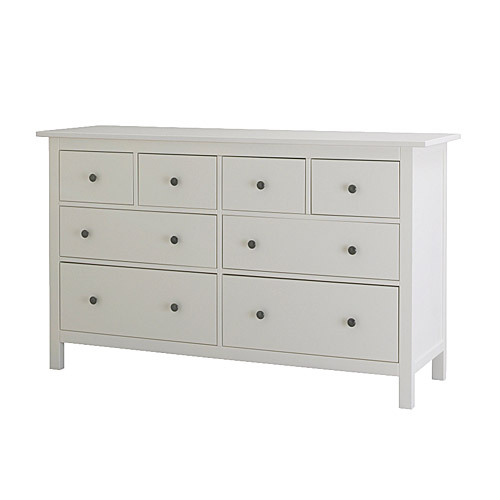 I really like all these pieces in white, but I don’t know how well it would match our walls. They are a very, very light blue/gray color – they look white in pictures. I love their color, but it wouldn’t be enough contrast to white furniture. I have two options… One, paint the walls of the room to a darker color – perhaps the same blue/gray but darker? I don’t mind doing this, but it does add another cost to the room. Unfortunately, the headboard only comes in white so I’d have to look for something else. I can’t decide which one I like best and will match our room. We have somewhat of a blue/tan/green theme going on, matching our quilt – I would probably continue with that color scheme. I need to find something for between the closets and door. 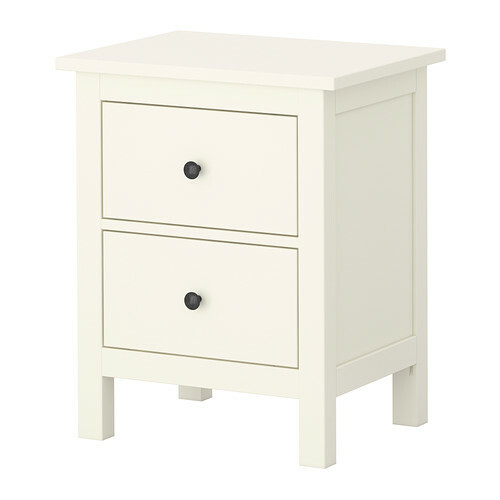 If we put a piece of furniture there, it needs to be narrow – I am always hitting my leg on the corner of the current nightstand. We also need an easily activated light, since the switch on the wall works the overhead fan. I was thinking a floor lamp, but at the same time I would really like to have some places in our room that are out of reach of little hands. 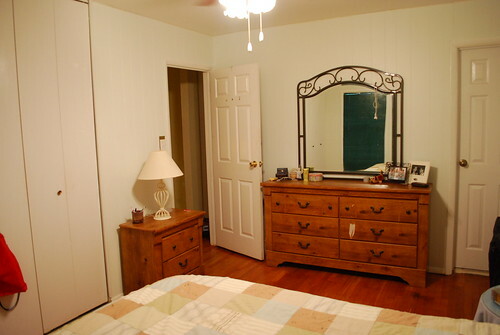 I could put shelves on the wall over the dresser – on either side of the mirror perhaps? I still need to think through our options for this. I haven’t been writing here much. Mostly, it’s because we really haven’t done anything to the house! I keep saying I’m going to have a small project every week that I write about, as sort of a way to force myself to actually do it. It works in theory, but I have been so busy lately that just keeping the house clean has become a challenge. We did do one thing this weekend. One of the reasons for my busyness is that I have taken on some freelance work. I have really been enjoying it, but I do find myself spending long hours on the computer, working on a design or trying to get emails out. I was sitting on the couch to do all this, but I realized that it was killing my back. I needed some sort of table to work, preferably in a room where I can keep an eye on my daughter playing. I didn’t want anything fancy because I didn’t want the temptation for clutter, but I wanted something big enough for my laptop and a notebook to jot down notes. We looked at Office Depot where I got my computer desk 6 years ago, but apparently they don’t sell inexpensive, simple computer desks anymore. So we went to the next logical thing – Ikea! Of course they had the exact thing I was looking for, and only $20. We headed down there to check it out. Unfortunately, my timing was all wrong as it’s back-to-school time here in Georgia, and they were completely out of the $20 desk. I decided to pop into the As-Is section to check it out before giving up. I did find a desk – or rather, a table? I am not sure what it was originally supposed to be, but it was perfect. The best part? It was already put together! It didn’t take long to find a spot for it, and I am really happy. I can easily see the entire room, and I am next to a 3-prong plug with a grounded outlet (which isn’t always a given in our house). I may switch out this new desk for the table I’m using for my sewing machine in the guest room, since this desk is prettier, but for now it’s working out pretty well. I’ve talked before about our pantry (or rather, lack thereof). We have been using a baker’s rack as a pantry, which would have worked great if we didn’t have a toddler. I would find pantry items scattered throughout the house, and once I discovered several cans missing labels (sounds like she’s living up to her middle name!). We looked for another pantry for a while. Our biggest problem was that the only space to put a pantry also had the HVAC vent for the kitchen, so whatever we got had to be at least 6-8 inches off the ground. We also needed something that was able to be baby proofed. Last Saturday, we finally bit the bullet and bought the one we’d found at Ikea. One thing I love about this cabinet is it’s so versatile; when we redo the kitchen we’ll be able to easily find another use for it in another part of our house. Anyways I’m still getting used to it, but overall it’s a good thing. Our kitchen needs a definite facelift! I naively thought, way back a year ago, that we would use our $8,000 for that project. Ha, that’s funny to think about now! I think it will be at least 5 years before we’re able to put money into aesthetic things, but that doesn’t stop me from thinking and dreaming. I will have to detail my thoughts about the kitchen in a future post. That’s the only open space we have in our kitchen. The previous owners had a table there, but we decided to use our baker’s rack as a pantry. 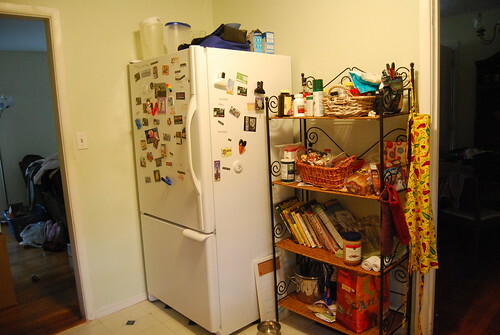 We keep cookbooks on the top shelf, pantry items on the middle shelves, and pots on the bottom shelf. It works pretty well, but there are two problems. The biggest problem is that it is sitting over the only HVAC vent in our kitchen. We have one of those plastic deflector shields to try and encourage the air to go out instead of up, but I don’t know how much it helps. I like that the baker’s rack is pretty open; hopefully that helps. The baker’s rack would be fine except for the other problem. It is impossible to baby-proof an open shelving unit like that! So far we haven’t had to worry about that, but I know that won’t always be the case, and I’m in the process of trying to figure out what to do. I don’t want to be constantly cleaning up everything Savannah takes off the shelves while I’m trying to cook or wash dishes. So I’m in the process of finding something that can be closed, doesn’t block the air vent, and isn’t too expensive. I don’t want to put a lot of money (or effort) into something when we’re going to just redo the kitchen in 5 years. 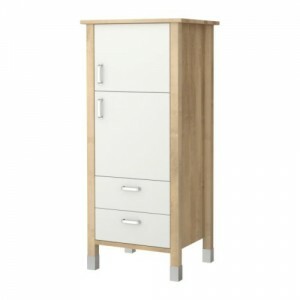 Tonight we were walking through Ikea and I saw this cabinet. I thought it really met our needs. 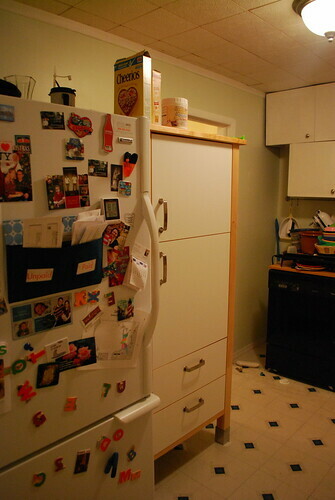 It is the same width as the baker’s rack, and just a few inches less than the depth of the fridge. It can totally be babyproofed, and I think would hold our pantry stuff really well. It also has legs and is raised off the ground, for the air vent. Paul doesn’t think it is raised high enough – he liked a different unit that I’ll talk about in a minute. The other negative is that it’s a little on the expensive side. I’m not saying it’s not worth the price, but it was more than I was hoping to spend. 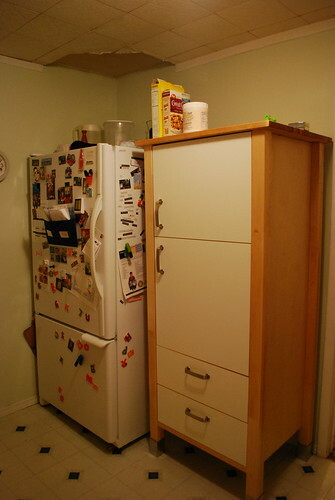 However, this is something that we’ll be using heavily for the next five or more years, and once we redo the kitchen and solve the pantry problem (which might incorporate this unit, who knows? 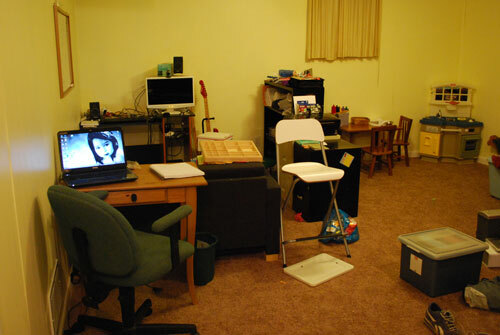 ), it can totally be repurposed to another area of the house. There was another possible solution at Ikea that Paul liked better. Unfortunately, I don’t have a picture of it, but it’s basically a tall wall cabinet that is much less deep than the other one. This one would attach to the wall, and can be hung as high or low as we wanted. I didn’t like the look and feel as much, and it wouldn’t fit in as well with our current kitchen (not that that matters a ton). When I got home and measured the space, I think it might be too wide. So all this might be a moot point. Anyways, I think we’ll see if Home Depot or Lowe’s have anything similar. Maybe we can find something that fits our needs that is less expensive. Besides, the one I want is sold out right now at our Ikea, so I have to wait anyways.